Posted July 24, 2017 by The Rapid & filed under News. The Rapid and the City of Grand Rapids unveiled a new plan to roll out what will become Michigan’s largest fleet of environmentally friendly buses and that will soon be cruising the streets of Downtown and Greater Grand Rapids. The new buses will be better than ever for the local environment by using compressed natural gas (CNG) as a fuel source instead of diesel. Bus riders will see 33 of the alternative fuel vehicles in 2017, including 28 in service for The Rapid on bus lines throughout Greater Grand Rapids and five for the City’s free DASH shuttle service in Downtown operated by The Rapid. Plans call for The Rapid’s 150-vehicle fleet to include 92 CNG buses by 2021, which will make up Michigan’s largest system of natural gas-powered buses. The City plans to purchase an additional four CNG vehicles in 2018 for the DASH and replace its entire fleet of diesel-fueled DASH buses over the next three years. “This investment demonstrates an important collaboration of innovative partners within our community, using the most sustainable, clean, cost-effective and safe products on the market for transportation solutions,” said Grand Rapids Mayor Rosalynn Bliss, who kicked off the announcement during a news conference at the city’s Sixth Street Bridge Park, where the new buses were on display. Mayor Bliss was joined at the news conference by City of Walker Mayor Mark Huizenga; Grand Rapids Second Ward City Commissioners Ruth Kelly and Joe Jones; Michael Bulthuis, The Rapid’s Public Outreach Coordinator of Community Engagement; Mobile GR and Parking Manager Josh Naramore; DASH Program Manager Barbara Singleton; Mary Judnich, regional manager for U.S. Sen. Debbie Stabenow; and Teresa Cuellar, regional coordinator for U.S. Senator Gary Peters. Reduce The Rapid and Mobile GR’s greenhouse gas emissions by more than 1 million metric tons over the use of diesel. CNG buses produce up to 20-30 percent fewer emissions than diesel-powered buses. Pose no threat to land or water if a spill occurs as CNG is nontoxic. Generate a combined total savings of $4.5 million because the cost of CNG is projected to remain about 60 percent less than diesel. Ensure access to an American-made fuel source with an abundant 100-year supply, diminishing Greater Grand Rapids’ reliance on foreign oil. In 2015, The Rapid board approved a $13 million contract funded entirely through federal and state grants to buy 28 40-foot-long CNG buses. The acquisition funds came from a $10.4 million Federal Transit Administration grant that was “proudly supported by both Michigan Sens. Stabenow and Gary Peters,” as well as a $2.6 million grant from the Michigan Department of Transportation, Judnich said. The Grand Rapids City Commission approved the $2.3 million purchase of five 35-foot-long DASH CNG buses entirely with local funds. Both orders are through Gillig, a Livermore, Calif.-based manufacturer that is among the nation’s leading bus producers. The Rapid is responsible for operating and maintaining the new CNG fleet. 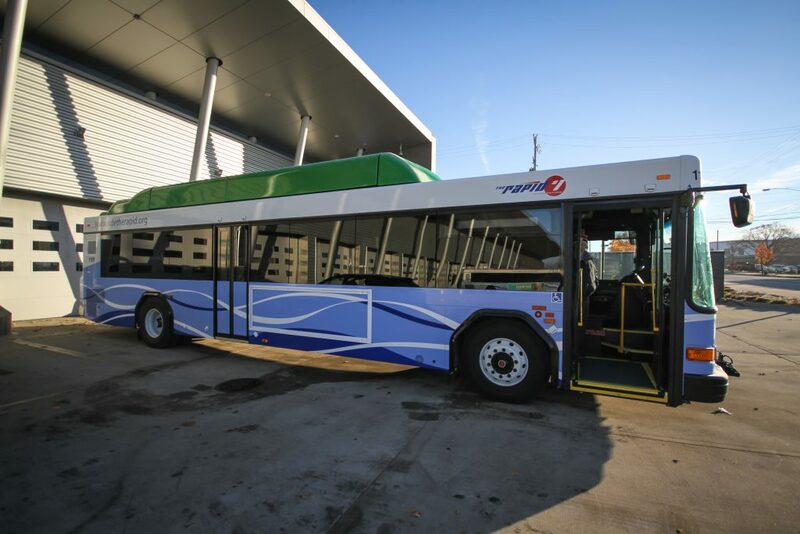 In 2016, The Rapid board also approved a $5.3 million contract with Walker-based Triangle Inc. to build a new facility at 1020 Market Ave. SW in Grand Rapids, about one mile southwest of The Rapid Central Station, that will fuel the transportation system’s fleet of CNG transit buses. The facility is tentatively scheduled to open in mid-August 2017. The Rapid averages nearly 1 million rides every month and provides approximately 12 million rides annually. The system serves Grand Rapids, East Grand Rapids, Kentwood, Wyoming, Grandville and Walker. Ridership on the DASH continues to grow and is around 30,000 riders a month and just under 400,000 rides annually.